A Google Wave started by the Seattle Times is being used to track information about the search for a man suspected of killing four police officers. It's the first Google-supported manhunt and finally a decent use for Wave. Update 6. 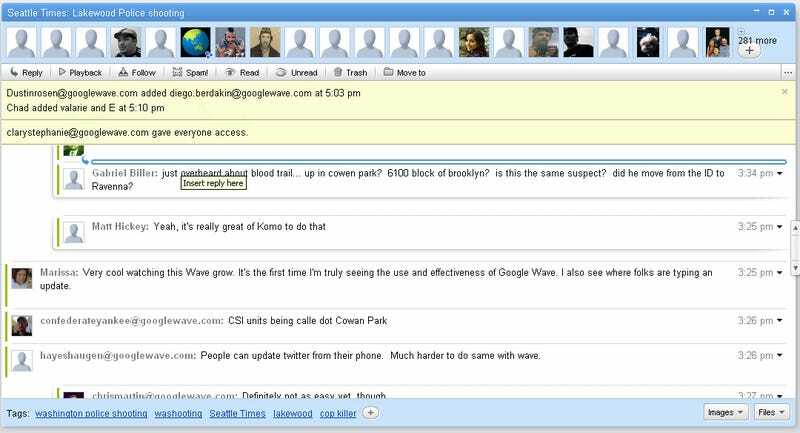 Due to Google Wave's real time updating capabilities, this is actually a rather fitting use. People are posting everything they know, from information about the suspect (right down to his old pictures and Twitter accounts) to news from police scanners. A Google Map of the manhunt is also being maintained with the major events of the search. Suspect reported near 13th and Lander. Update 6: The 13th and Lander report was deemed unrelated to this search.